According to the Medical Care Law, every meal for the inpatients must be checked by someone just before serving it to the patients. 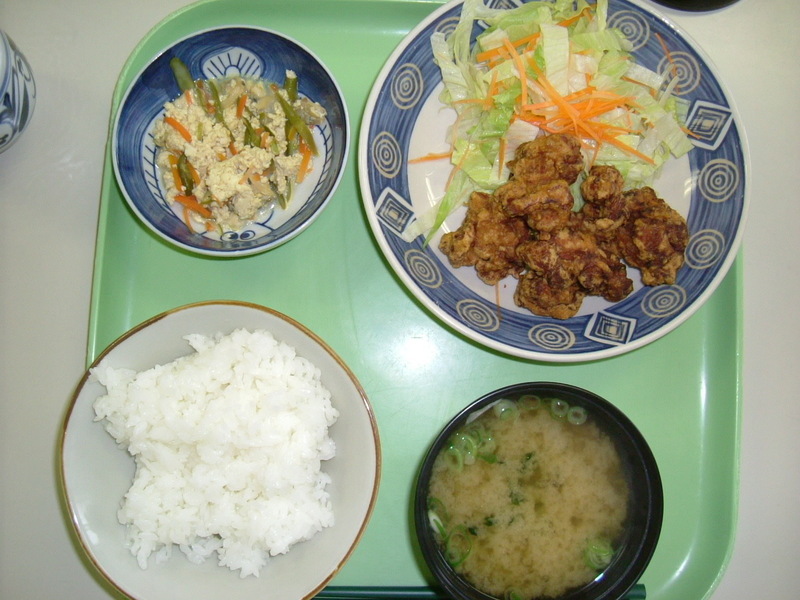 I usually check ordinary lunches for the patients who are hospitalized. Besides, some special meals are prepared for the patients who suffer from specific diseases; diabetes, hypertention, kidney or liver diseases,,,and so on. I check the ordinary lunches and fill in the form (shown in the picture) as follows. The time I check the lunch. How about taste; excellent, good, bad. How much the rice is; too much, moderate, too small. How hard the rice is; hard, good, soft. How it looks; excellent, good, bad. I think the kitchen staff of my hospital are excellent. Every lunch is satisfactory to me. I took a snap of today's lunch shown in the 2nd picture. I've known only the title of this story before now. This story was interesting, and I could read it at ease. I didn't know 1 word and some phrases in the whole story, but I could easily infer the meaning. I think I can graduate from Penguin Readers Level 2 but I'm going to read some more books at this level because I can enjoy reading books at this level. After that, I'll go up to the next level. This was less enjoyable. The story was sort of jumpy. 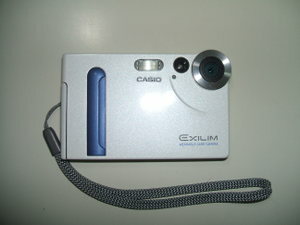 I bought a 4th generation digital camera. The 1st generation digital camera was only a 350 thousand pixel still camera. 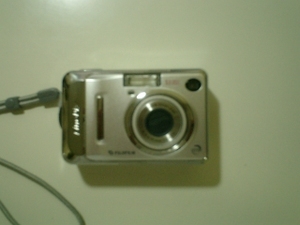 It was the most popular digital camera in Japan when I got it about ten years ago, but now it's in my stockpile and will never be used. The 3rd generation camera shown in the 2nd picture was very thin, only 11mm, and light. It's easy to be carried in my pocket. But it requires a special mount device to be charged and the mount is bulky. I didn't take it when I went out for more than a couple of days' trip. The camera shown in the 1st picture, which I bought today, is powered by 2 AA size dry batteries. There's no need for special charging devices. If I can't charge it, I can get AA size batteries everywhere. I'll post various photos here from now. Good morning. Isn't everything nice? Today is the 1st anniversary of my 1st post on this blog. I'm happy to have received e-mails from more than 10 countries in a year. I sometimes access Korean websites and write something these 3,4 months. Consequently the access to my blog from South Korea has increased. I'd like to talk with people who live in 속초시 (束草市） in South Korea. If you are one, send an e-mail me! I'd like to get information about coastal routes from 속초시 (束草市） to Russia around Vladivostok in case of a North Korean crisis. My wife is absent on business for 1 week. She is in France or Italy now so I have to do many household chores. I was going to cook delicious and good-looking meals this morning and take pictures of it. Of course, the pictures were going to be posted on this blog so that my wife might feel at ease to see it on the internet. But I couldn't. I don't know where anything is. Where is the salad oil? How do I use the oven? It was a reminder of the movie "Kramer vs. Kramer". In this movie, the central character, Dustin Hoffman, makes French toast for his son at great pain. I'm just like him. Consequently, our food was not so beautiful. I gave up posting it's picture. Is this a reality? This is my first impression just after finishing reading this book. 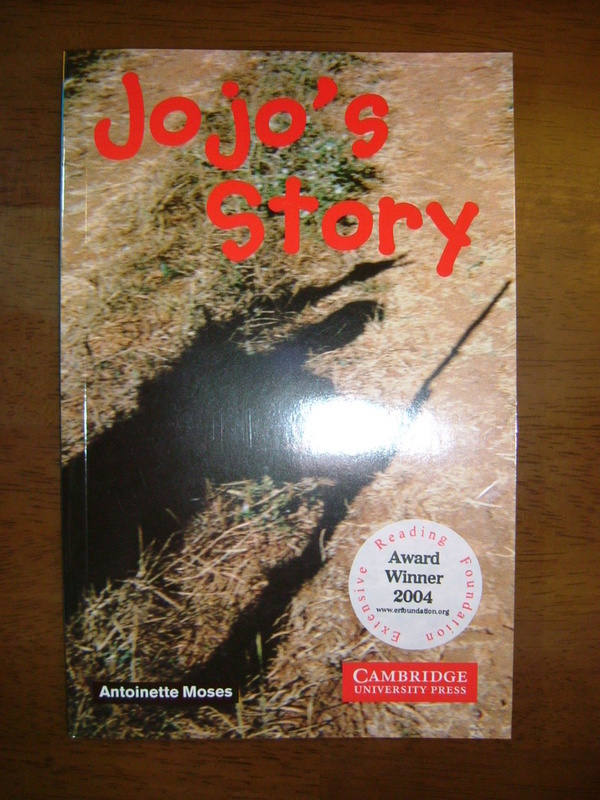 The story starts with the scene where Jojo is hiding in a field. 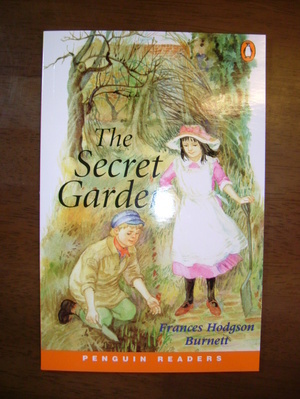 The scene is described using the whole of page 1 with very short sentences. It contains some abstract expressions and I couldn't understand it all. Sentences are short and written with easy words, but I felt it was a little bit hard. However I easily realized that Jojo confronts the serious threat of something. I thought and hoped that the unhappy central character, Jojo, would get a better life. To my regret, Jojo is going to be a soldier! I felt depressed. 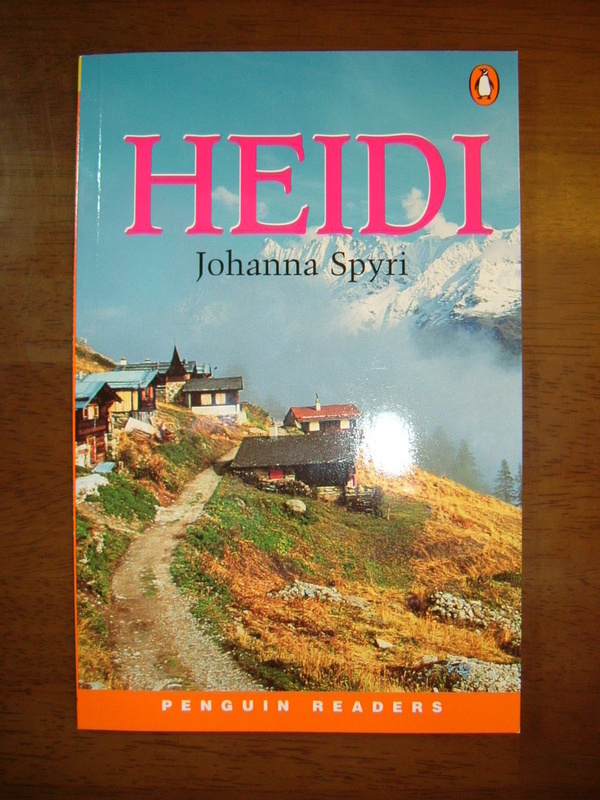 "Heidi in the Swiss Alps" was broadcast as a cartoon in Japan when I was a little child. But I didn't watch it, so it was the first time that I knew the full story. I read through it in about 2 hours. I enjoyed it as much as I wasn't aware of time passing. I'm living surrounded by many artificial things; computers, cars, electric appliances, something else like that. 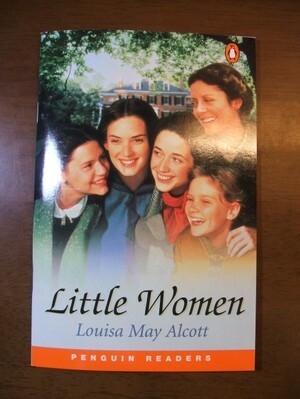 I wondered if life described in this story was the real, happy life. At the beginning of the 20th century, two adventurers headed for the South Pole. 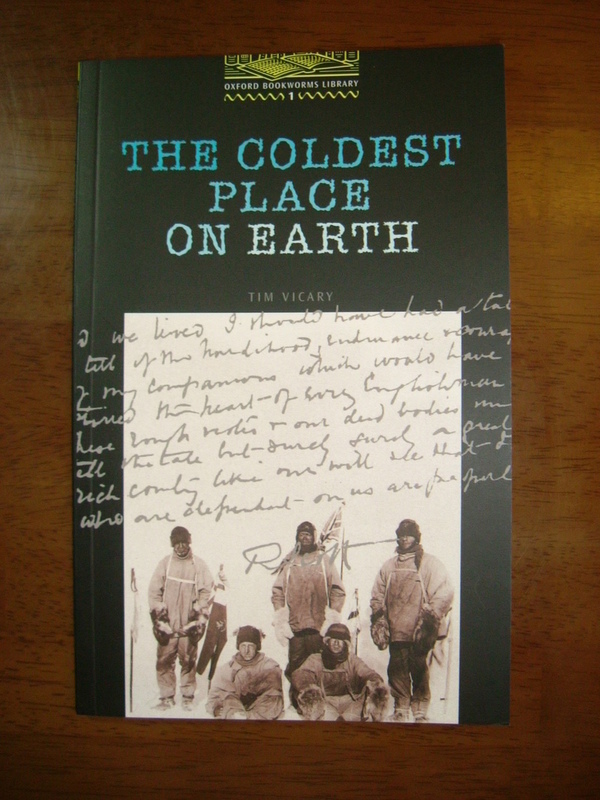 This novel originated from the great race to the South Pole between Britain's Robert Scott and Norway's Roald Amundsen. Every detail of the race is omitted but I felt the harshness of the natural environment in Antarctica. I sometimes climb up mountains in the winter. My mountain gear is extremely superior to theirs. My clothes and tents are warm and light. My food is light and compact, but contains high enough calories to survive in the harsh environment. I'm happy to be born in this era. I, my wife and A, went to a public bath; "Yurara". Yuri was out to take a mock exam. 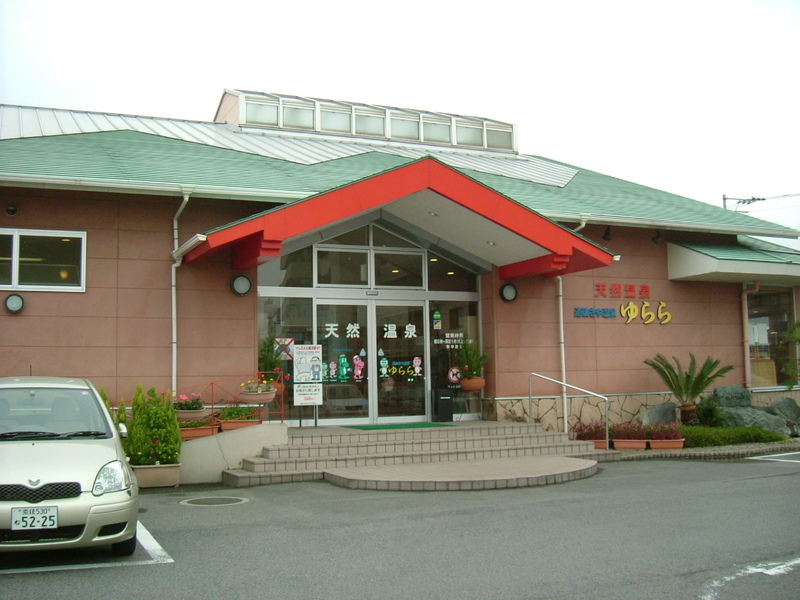 The hot water of this public bath is supplied from the source of Dogo hot spring. Dogo hot spring is famous as the oldest hot spring in Japan, but the atmosphere of Dogo spa is modern and urban. I like rustic hot-spring resorts and don't like Dogo spa. Anyway, we soaked and relaxed in a hot spring. This is the first detective novel that I have ever read in English. You might not believe it, but it's true. English has been only one of the real ways to get some information from out of Japan. I wondered if I could fully enjoy the novel. That concern proved unfounded. I could read it without translating English into Japanese. I input the story into my brain in English and could think in English. Besides, my thinking was always on the scent of the story. I could point out the criminal and the key of the heroine's deduction before the ending of the story. 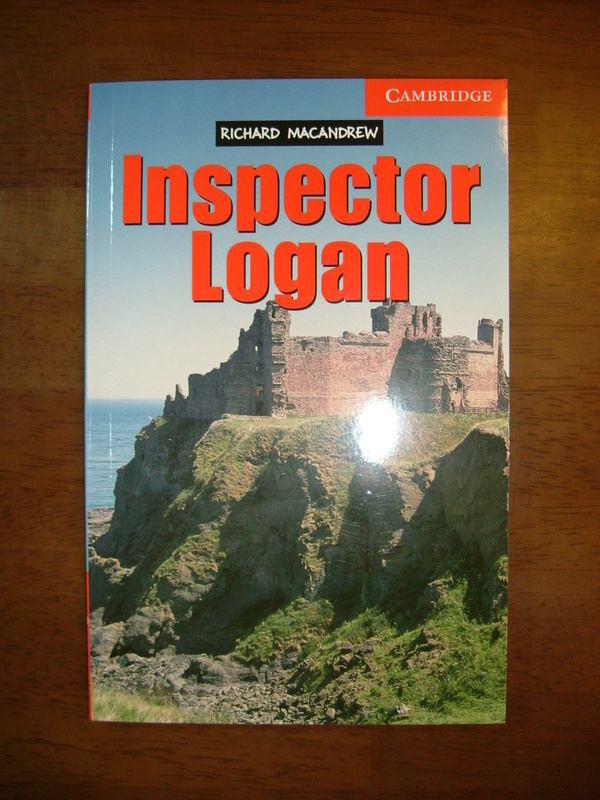 The central character (Inspector Logan) was a female. At first I was mistaken by a prejudice that the Inspector was a male. The pronoun "she" and "he" made me mixed up at first. I was asked to be a teacher at a high school by the Matsuyama Surgeons' Association. 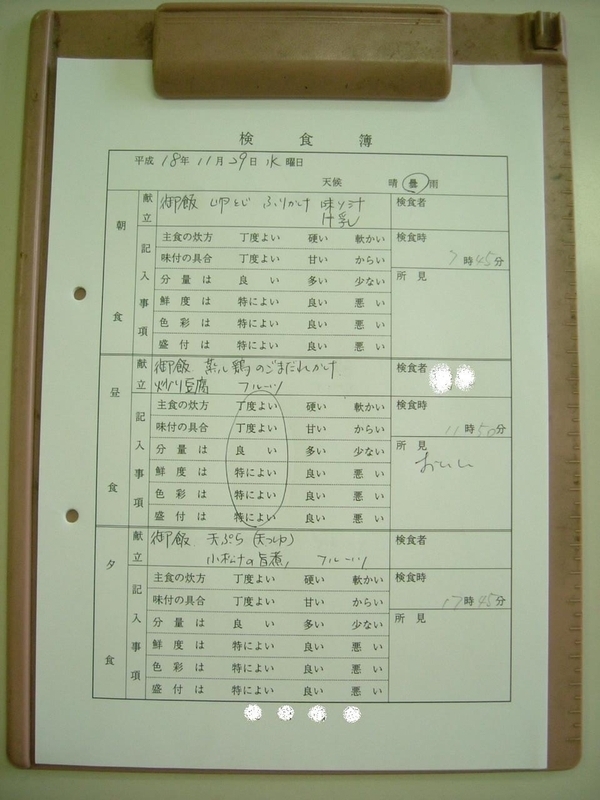 The former teacher resigned abruptly and the board of the high school asked the head of the Matsuyama Surgeons' Association to have someone replace him. The high school has a professional course to be a registered nurse. I'm going to teach them general surgery. I've had a pain in my neck. I started extensive reading. I set my goal to a million words in a year. I can buy Graded Leaders at Amazon.com. I bought some books. When I ride my bike, my wife often warns me not to get injured because I'm not young and not so prompt in every situation as young riders. Next, she complains about my shoes. I don't care about clothes, shoes,,,anything to put on in daily life. I put the same shoes on when playing with my dog, going to work and gardening. Of course, when riding my bike, I think riders can understand it, the left foot must shift gears on the dorsal foot. Consequently the toe and dorsal phase of the left shoe get worn to threads. The shoes, worth 200 dollars, don't last half a year. 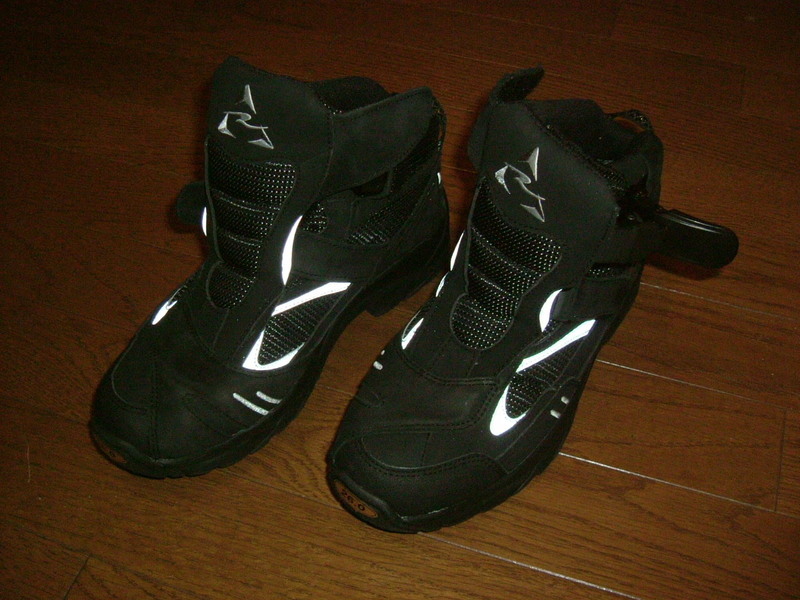 So that, I got new riding shoes, as shown in the photo. I found them in the motorcycle parts shop near my house, but they were more expensive than I expected. I wrote the model name and code on my memopad. After that I found the same shoes on the internet with 52% OFF! The next moment I found I had clicked the order button. I tried to put them on this evening. The feeling was wonderful. I'm happy because one of many complaints of my wife has disappeared. When I was a child, both of my parents were teachers at elementary schools. They had to accept orders to transfer without any complaint for better or worse every few years. Following them, I was transferred to various places. I attended 3 elementary schools in six years. It seemed that as soon as I became accustomed to the school and the area, I had to move. Moving to a new place was always sad to me, but on the other hand, moving created a feeling of anticipation. I was excited about exploring a new area, a new school and the new customs. I've lived both in the mountains and at the seashore. I know the country life and the life of fishing villages. I like climbing, hiking, fishing in the river and sea and swimming. All those hobbies were born in my childhood. It might be a lucky thing to have spent my childhood in such a variety of places. About 30 or 40 years ago, the transportation conditions were bad where I lived. Having a private car was not very common. My family didn't have a car. There was no moving company around my town because there were not many companies that requested moves. Every time my parents had to move, they asked local drivers or fishermen who had trucks or boats to carry our furniture and household goods. You know, this was tough work for my parents. But for me, it was like a festival. Many people gathered around my house and helped us to move our furniture, put things into the packages, and prepared light meals. Some people gave me presents as a token. It was a fun. After I graduated from elementary school, I was sent to a unified junior high and high school in the local capital city away from my family. I stayed there for 6 years. It was the longest stay at one place in my life until now. After graduation from medical school, I was employed at a nation-wide chain of hospitals. I was ordered to move frequently. I wonder if such a life has made me a kind of vagrant. Traveling is one of my favorite hobbies. Railway stations where I get off for the first time and strange streets where I walk pluck at my heart strings. It's not an issue of whether I like a new place or not, but new places arouse my curiosity. In other words, I'm intrigued by things outside of my daily life. It seems that every cell of my brain lights up when I go somewhere new. I think these feelings are the driving force behind my wish to keep traveling. I wrote about a patient who suffered from mesenteric panniculitis and had surgery on October 27th. I'm going to report his passage afterwards today. After his last operation on Oct.27th, the patient was getting better and his mental status showed remarkable improvement. I felt that he overcame the illness. However, I found swelling of the wound on his abdomen today and I performed ultrasonography on his abdominal wall. To my regret, I found fluid collection in his abdominal wall just beneath the wound. I and my colleague neurosurgeon thought that the VP shunt tube had come out of the abdominal cavity and must lie in the abdominal wall. The cerebrospinal fluid (CSF) coming out through the VP shunt tube was surely the cause of the swelling. As we thought like this, we performed the operation again with use of a local anesthetic. We were surprised to see the tip of the VP shunt tube. The tube didn't come out! It stayed in the abdominal cavity as we had set it in the previous operation. The CSF coming out of the tube formed the cyst in the abdominal cavity and wasn't absorbed by the peritoneal membrane. Overflowing CSF came out of the cyst and formed a fluid collection just under the wound. After all, we fell into the same rut. Abnormal granulation was formed around the VP shunt tube and interfered with the drainage of the CSF. Although we prevented these granulations from causing intestinal obstruction this time, out of necessity we are performing external drainage to remove the extra CSF at present. We have to figure out the solution. I know that mesenteric panniculitis is benign, never malignant. Nevertheless, it always bothers us. Today I just stopped by to buy a few English books at the biggest bookstore in this city on the way back home. I directly went up to the 5th floor, where there are many foreign books. Many colorful English books line the shelves. There are a lot of original books which have been made into movies. I thought that I'd like to read one of those, but the book jacket of "The Old Man and The Sea" came up in my mind and I thought twice about getting those. The paperback of "Black Dahlia" seemed to be interesting. Speaking of which, I wonder if I could have read through the whole novel. 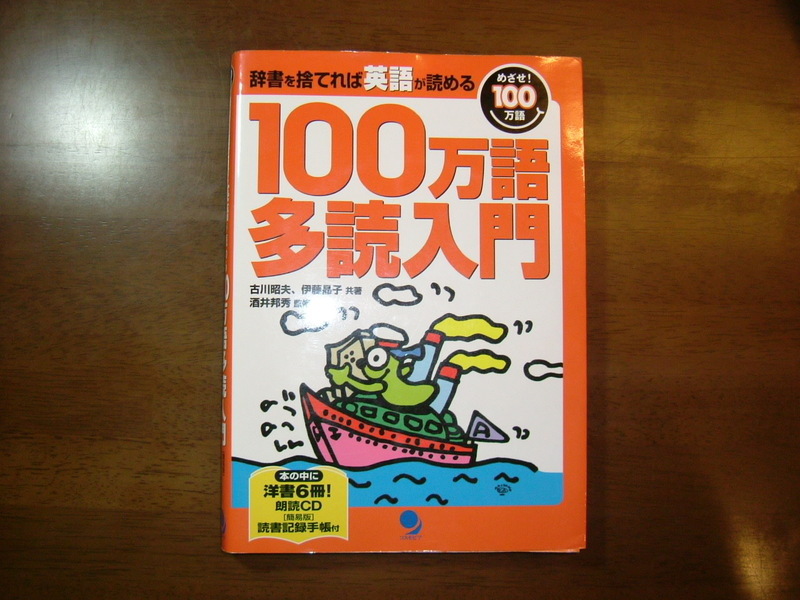 An extremely high level of reading skill in English is required to enter the top Japanese universities. I read a lot of reviews or essays. I had to translate hard essays of Bertrand russell into Japanese as training for the translation. It was a reading for the sake of passing the university exam. If someone asked me how were the readings, I would answer, without hesitation, that it was not amusing. I'd like to have a great time reading books. I was looking for something good and found a book shown on the photo. This book had what I want to get. Today might be an epoch-making day. This book recommends extensive reading without a dictionary. This book says, "if you don't understand a word, skip it and infer the meaning from the words just before and after that unkonwn word, and read easier books than your level." Next, this book set the first stage of extensive reading to a million words. I decided to try to read a million words in a year. 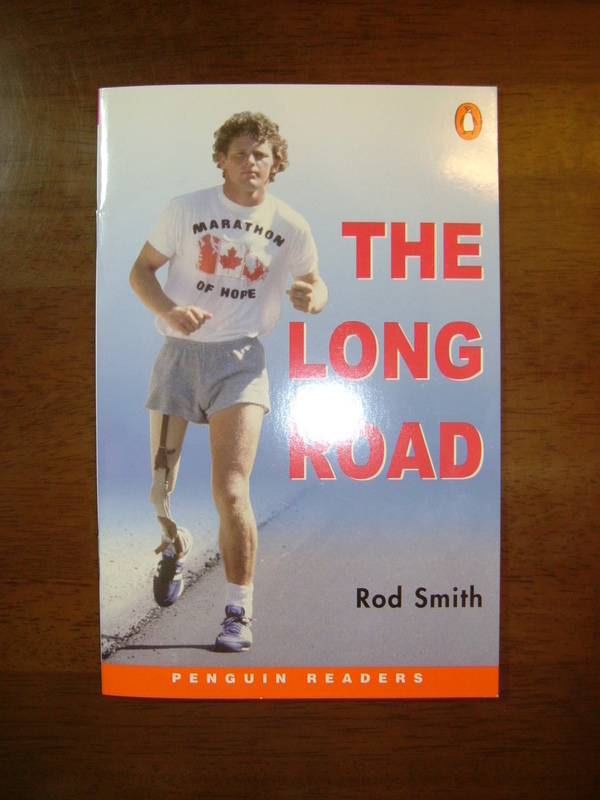 I knew the Penguin Readers, Oxford Bookworms, Macmillan Readers, Cambridge English Readers,,,. Wonderful! These books were categorized by their level. I'll report the contents of each book here. If I stop extensive reading, laugh At Me! I've been writing this blog for one year. I often conducted searches of unknown words or phrases on Google and emulated examples which were written by native people. I have been managing to keep writing this blog, but I frequently realized the need for extensive reading. Today, the afternoon schedule was cancelled and I dropped in at an antiquarian bookshop near my hospital after lunch. There are many paperbacks here. I found a paperback book "The Old Man and the Sea", written by Ernest Hemingway in the corner of the shelf. It brought back memories of my junior high school days. I bought it when I was 13. I was just a first year student at junior high school, and just after I started learning English. I thought I could understand it with an English-Japanese dictionary. Of course, it was an illusion. I couldn't read it at all. Because I looked up every word in the dictionary, I couldn't go ahead. It was a reckless attempt, I think. I have never bought any paberback since that time. It's November! I have 3 private events this month. The 1st event is to take an official exam of The Hangul Language Proficiency Test. I've been learning Korean for 2 years. It's the first time for me to take this test, like TOEIC for English. The levels of ability of Korean are categorized into 5 grades. The highest level is called 1st class, and lowest, just beginner level is called 5th grade. I'll take level 4. I'm confident. The 2nd event is that this month is the 1st anniversary of writing my blog. I started writing blogs in November last year. I'd like to congratulate myself on keeping it up for 1 year. The last one is that I have to be a house husband for 10 days during my wife's business trip. She's going to Europe at the head of the college trip. She is a teacher at a technical college. I have to get up earlier and prepare breakfast and lunch for the kids. I have to make dinner at night. I already feel depressed now.